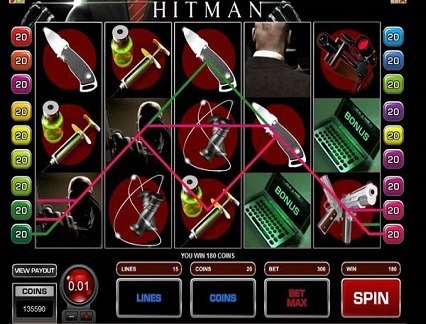 Game Information: Microgaming launched their take on the highly successful Hitman franchise in 2007 and since then, this 5 reel and 15 pay line pokie has become one of the most popular themed video pokie played at Microgaming online casinos. The game is stylish and features quality graphics that perfectly represent the dark, deadly and mysterious world of Agent 47. The game features Microgaming’s own offerings, including awesome special bonus rounds, an adrenaline-filled soundtrack and much more. Let’s take a closer look at how Microgaming have set Agent 47 and the world of the Hitman up for you to control! The wild symbol in Hitman is none other than Agent 47 himself, appearing in true style with his trademark twin handguns. IF you manage to land Agent 47 on the second, third or fourth reels, he will automatically turn into an expanding wild symbol, covering the entire reel. The wild symbol can be used to substitute any other game symbol other than the bonus symbol to complete winning combinations. The expanding wild covers the entire reel, making winning combinations even easier. Aside from the wild and expanding wild symbols, Hitman also features other cool game symbols including the laptop bonus symbol, Insignia scatter symbol and the 18 logo symbol. Getting three or more Insignia scatter symbols across the reels will trigger the ‘pick and click’ bonus game. Here you get to pick one Insignia icon to reveal an instant cash prize. Getting three to five 18 Symbols will trigger a free spins round consisting of 18 free spins which also include a 2x multiplier. The free spins bonus round can be retriggered with three or more 18 Symbols and the round also includes expanding wilds. Getting three or more Laptop bonus icons will trigger the special ICA Mission where you get to choose one of five different targets. The targets are all different missions, with varying degrees of difficulty and varying payouts. Once you have selected the target you would like to go for (the mission), you will be automatically awarded an instant cash prize. The next phase involves you selecting a weapon for the mission, again followed by an instant cash prize. The final phase is the mission itself and this phase also includes a multiplier of up to x6 for maximum winning boosts. As one would expect from Microgaming, the graphics and sounds in Hitman are very close to the way the movies as well as the video games look and feel. The colour scheme is predominantly black and red and includes a soundtrack that is suspenseful and eerie at the same time. The game is filled with cool weapons from the franchise including knives, garrottes, sniper rifles, hand guns, syringes filled with lethal contents and of course, the special game icons mentioned above. 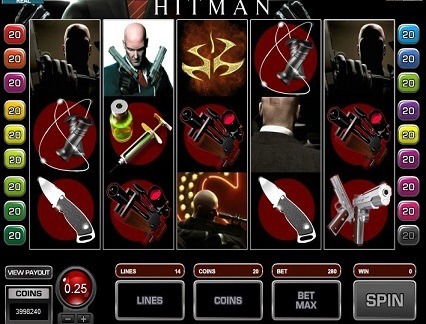 Hitman is a medium volatility jackpot game that offers substantial wins at fairly regular intervals. While the game is not a progressive jackpot pokie like Microgaming’s Mega Moolah, Dark Knight or Major Millions titles, it still produces respectable wins. There are essentially two main jackpots up for grabs including the biggest game jackpot of a potential 270,000 coins. This is possible by accessing the Contract Bonus feature, when three mission scatter symbols on reels 3, 4 and 5. The second jackpot of a potential 6,000 coins is possible with the Insignia bonus symbol, appearing on reels 1, 2 and 3 at the same time. These potential jackpot amounts are possible when betting the highest coin value and maximum bet. 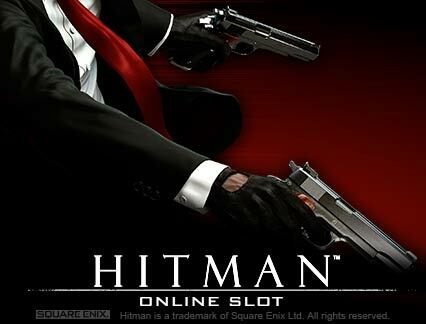 Hitman contains a number of cool special features including the Agent 47 expanding wilds which are also animated when covering the reels on which he appears. The special bonus round made possible by landing three or more special 18 Logos produces 18 max bets and 15 line spins for mega wins which can also be doubled at the end of the game.